Before I get into today's post I need to address an issue we just discovered. 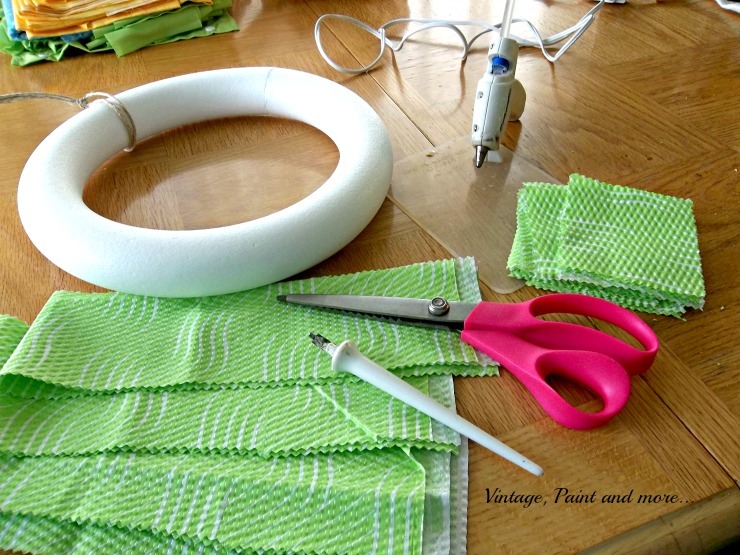 Remember signing up for Vintage, Paint and more's emails so you wouldn't miss any of the projects and tutorials? Well, we just discovered that they were being blocked due to a technical issue. But with the help of an expert in this field we were able to get that issue resolved and now you will be receiving those emails just as you signed up for them. Thank you so much for your patience in this manner and if you have any questions just ask in the comments below. I will get back to you. My how time flies. It actually seems we were just making our New Years Goals and putting away Christmas - then the Valentine decorations and here we are thinking of Spring already. But when so many are still experiencing lots of snow it is hard to believe that it's just around the corner. So in celebration of Spring soon arriving I am going to show you a quick little Spring wreath you can make. 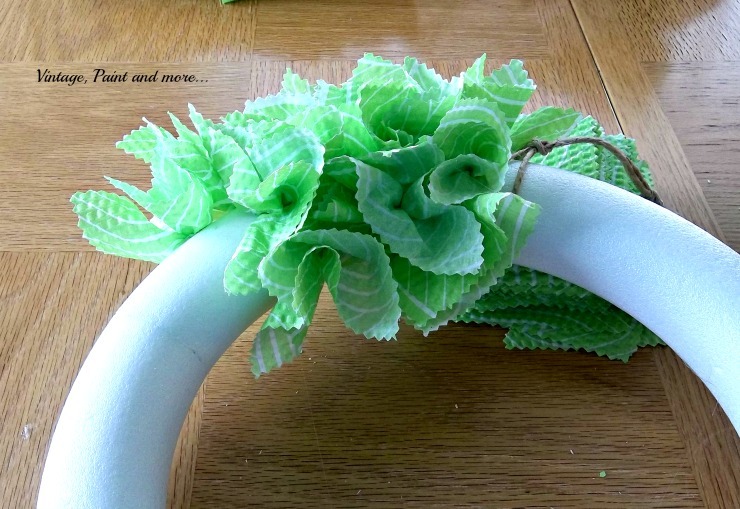 This little wreath could be used for St.Patrick's Day as well as the Spring season. 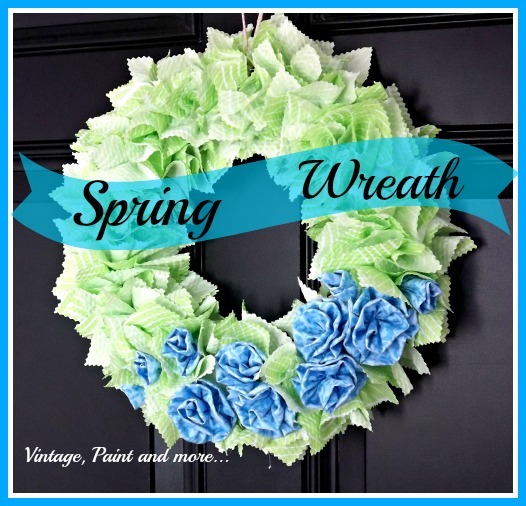 This cute little wreath is made of spring green fabric and blue fabric rosettes. It is quite simple to make but there are a lot of pictured steps so let's get started. 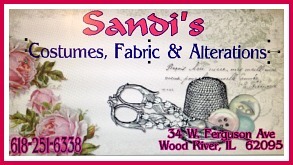 First you will need to cut your main fabric(mine is the spring green) into 3" squares with the pinking shears. 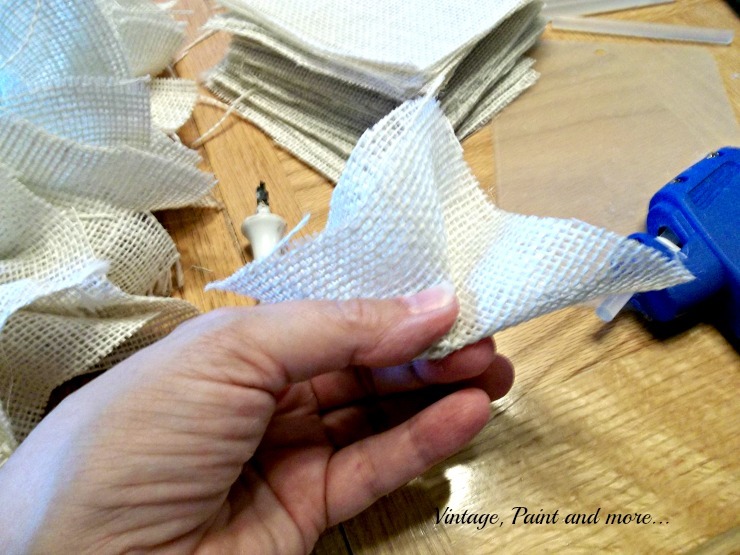 Using the shears will keep the fabric from fraying and give it a nice little edge. I don't remember the exact number you need. When I do these I usually make a nice stack and then add to it as needed. 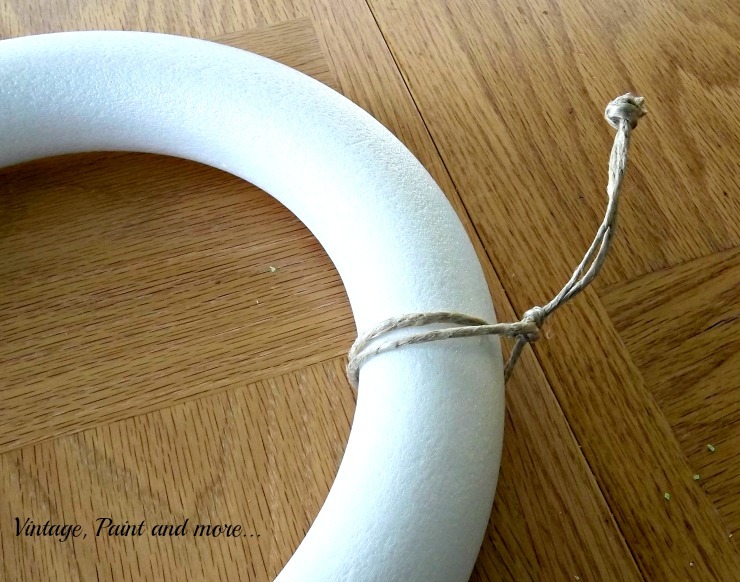 Tie your twine around your wreath form and make a loop. This will be your hanger. 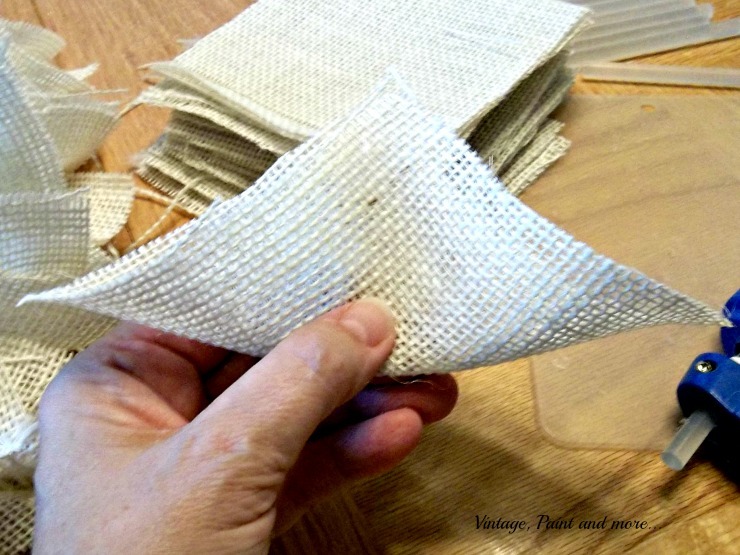 Fold your fabric in half diagonally corner to corner with right side of fabric on the inside of the fold. 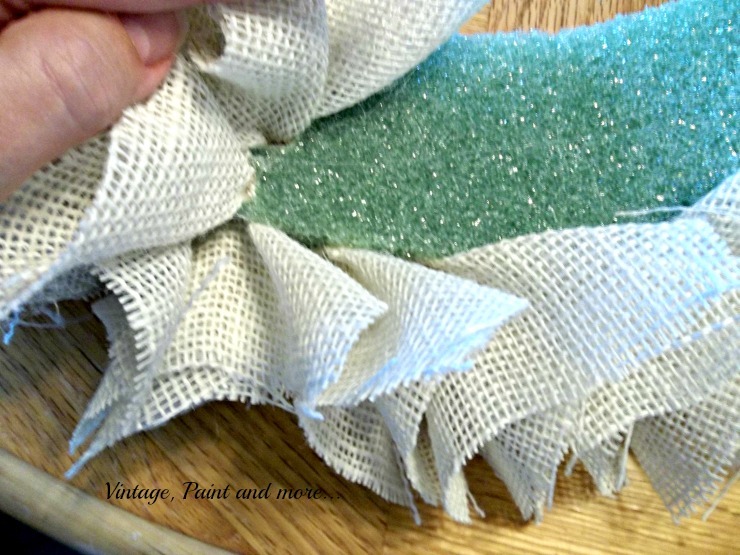 This will let the print of the fabric show when placed on the wreath. 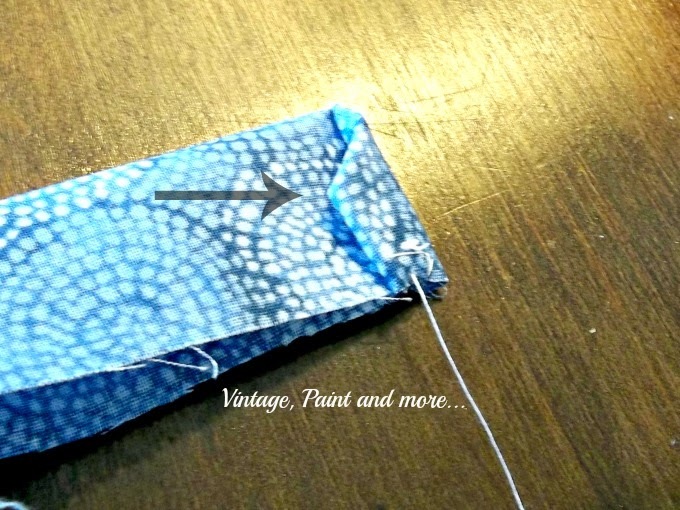 Make a tiny little pleat at the center point, add glue to it and then push it into the Styrofoam with the pencil or screw driver. Which ever one works better for you. This is a closeup of how the squares will look in the form when pushed in. Two views of the placement of the fabric squares. Start on the inside of the wreath and work back and forth across all the way around it. You may need to go back and fill in any little gaps you may see along the way. 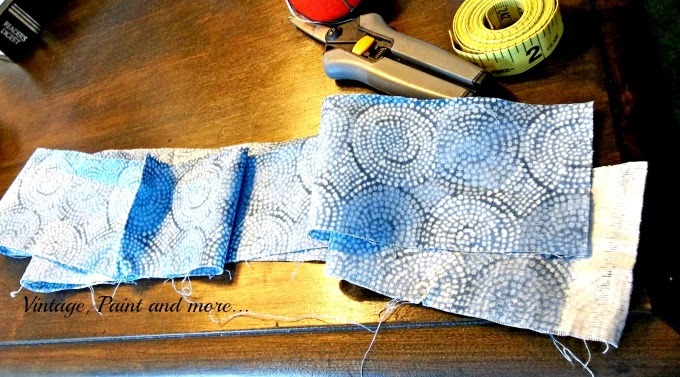 Cut the contrasting fabric in 2 1/2 inch wide by 36 inches long strips. Fold this strip in half length ways. Then turn done the corner as shown above and tack it with a long piece of thread on a needle. 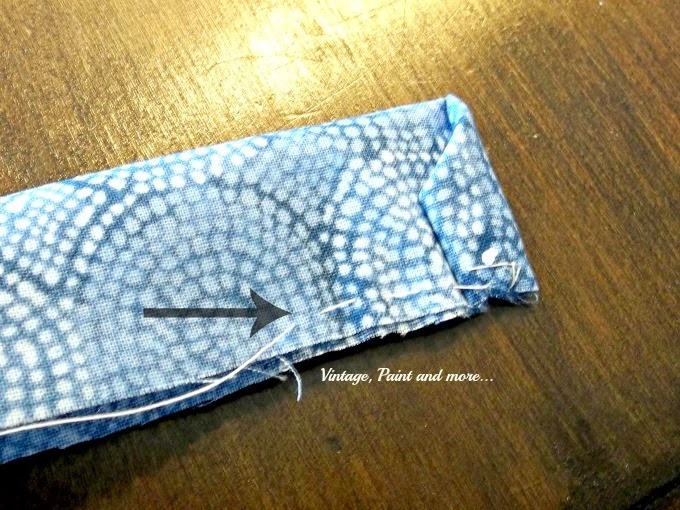 Fold the bottom corner over to the fold edge you just made and tack it. This will be the center of your rosette. Fold this fold over one more time and tack it in place. 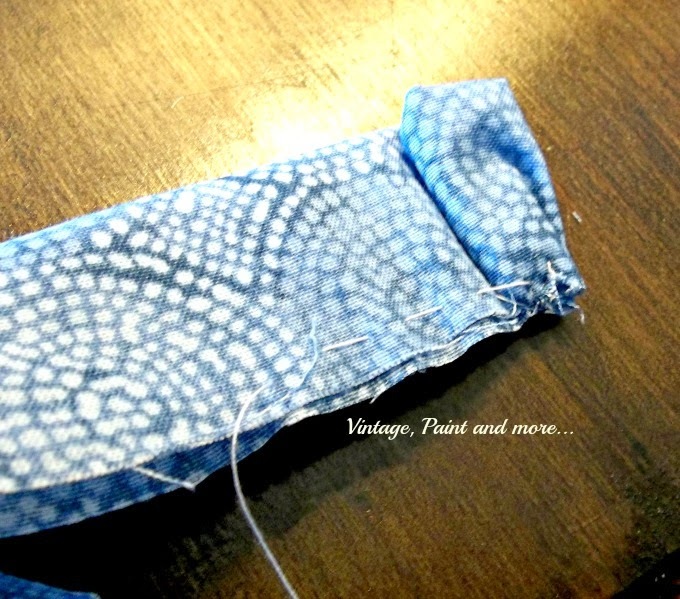 Now make a basting/running stitch along the bottom edge of the strip about 1 - 2 inches. 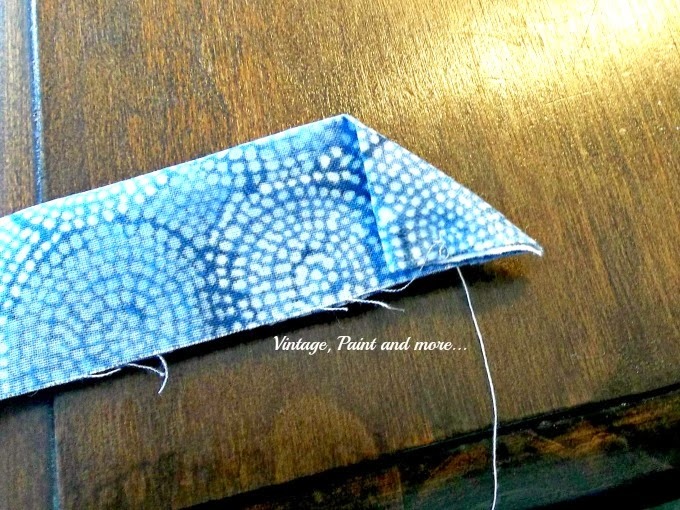 Pull the stitching to gather it and then tack to the already folded "center" portion . It will look like this after the gathering and tacking. Do another running/basting stitch about 1-2 inches along bottom edge again. 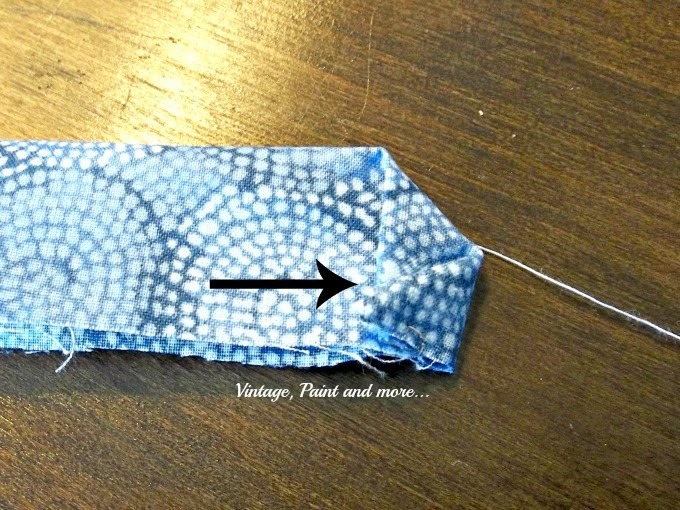 Pull the stitch to gather the fabric and tack along the edge of the already gathered portion. You will see the beginning of the formation of a bud. 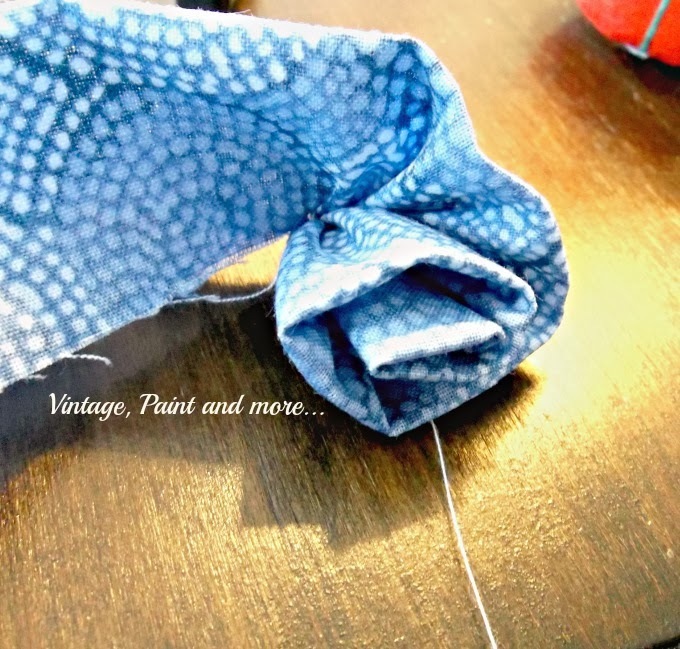 Continue to follow this step of stitching and tacking to the end of the strip of fabric. Tie your thread off and cut. The bottom will look like this. just wrap as I have done here and tack it along the way to keep it in place. I actually do these while watching TV and do not want to get my machine out. just cut off the remaining length of fabric. and looks great for St. Patrick's Day. But it will probably be there to usher Spring right in this year also. 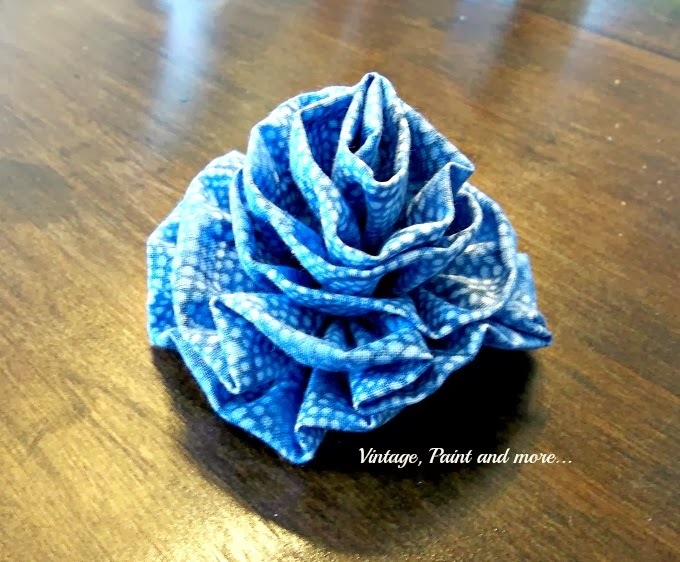 It can also be used for different times of the year depending on the fabric you use - think summer, fall, Christmas, the possibilities are endless. This is actually my first bit of Spring decorating . What have you done or are you waiting just a bit longer to start? I will be linking up to the parties listed on the Where I Party page. 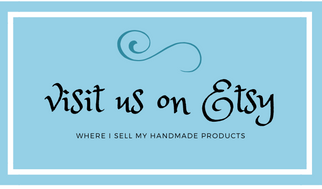 Please stop by these parties and check out all the great inspiration and creativeness found there. I love this look! I definitely need to work on a new wreath for spring. Thanks for the idea! What a pretty wreath! Love the fresh spring colors!! Awesome DIY. Love this! The color and pattern options are endless! Gorgeous wreath with great complimentary colors. You're right this would be great for St. Patty's Day. I've never seen one done like this, thanks for the inspiration! Wow! 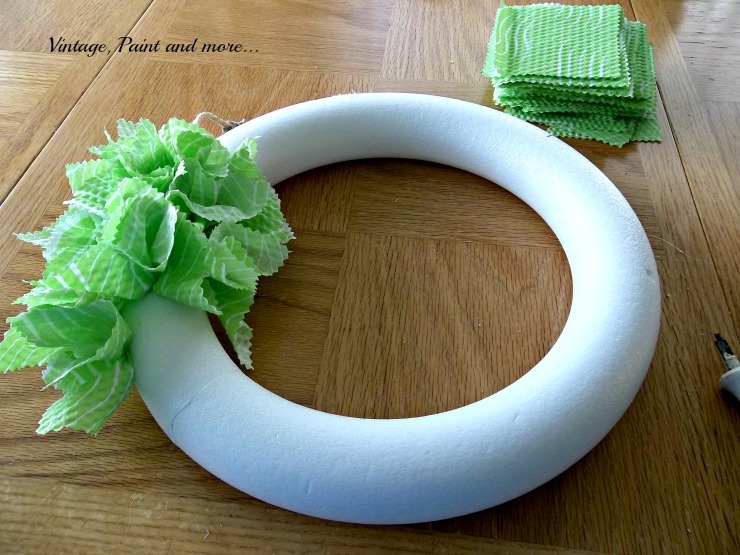 Really like your beautiful wreath and the tutorial is so helpful! Pinning this to my need to make board! Thank you so much for sharing on VMG's Brag About It link party! This is beautiful and clever! Happy Spring! I really love your wreath! Thanks for the inspiration! Stopping over from Brag About It linky party! Very pretty, Cathy! What a creative way to make this lovely wreath! Love all your great step by step images!! Thanks!! This whreath is very beautiful! love your step by step images, they help a lot. Simple and bright, perfect for spring. I really like the rosettes on there. 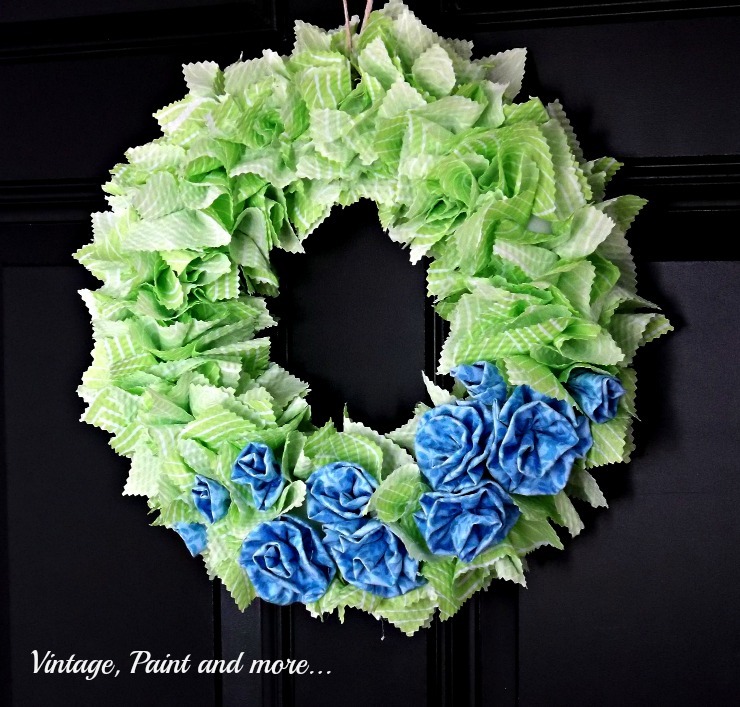 What a pretty wreath Kathy - I love the fresh green fabric that you used! I appreciate the easy to follow tutorial. This is simply lovely! Glad to find you today at Embracing Change Link up! Very pretty. Love it. Thanks for the DIY. I just made a new spring wreath a few days ago. I used roses, vintage lace and tulle. The pink and red roses compliment my red front door and the lace and tulle add a shabby spring touch. Cathy, this is just beautiful! You could do it in so many different ways. Love the green/blue for spring. Thank you for linking at Snickerdoodle. Hope to see you again soon. Pinned. lovely wreath! So full of spring and smiles! 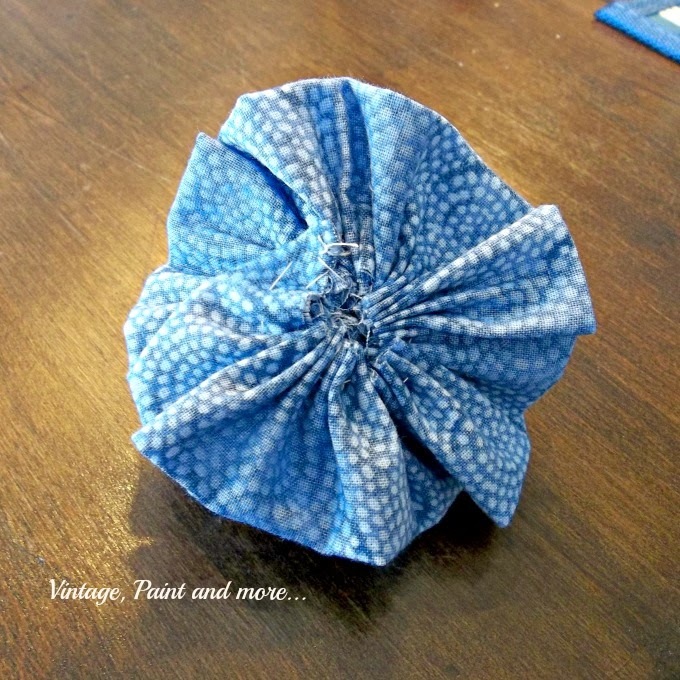 Beautiful fabric choices and we so appreciate the step by step tutorial! Thanks for sharing with us at Snickerdoodle Sunday! I have made paper wreath doing the same thing and they were a lot of fun. Love how your green one turned out and the rosettes are so pretty! Thanks for sharing with SYC. Great wreath! Thanks for joining HSH! nike SB Stefan Janoski Max sale nike SB Stefan Janoski Max sale hurry to leave this convention has been put aside, the day but nike SB Stefan Janoski Max sale promised to accompany her to nike free run australia sale see that cheap residual brain movies. Today is not exactly a good even with her and tell her the opportunity to do further. nike SB Stefan Janoski Max sale Legend of cinema, when nike SB Stefan Janoski Max sale two people stare at each other and then darkness.